Primed to enable astonishing performance and breathtaking image quality, making it a top choice for gamers who expect the best. Leave HD in the dust by gaming on displays much, much larger. Whether using a 4k monitor or combining multiple HD monitors, you’ll get an expansive experience that’s truly out of sight. 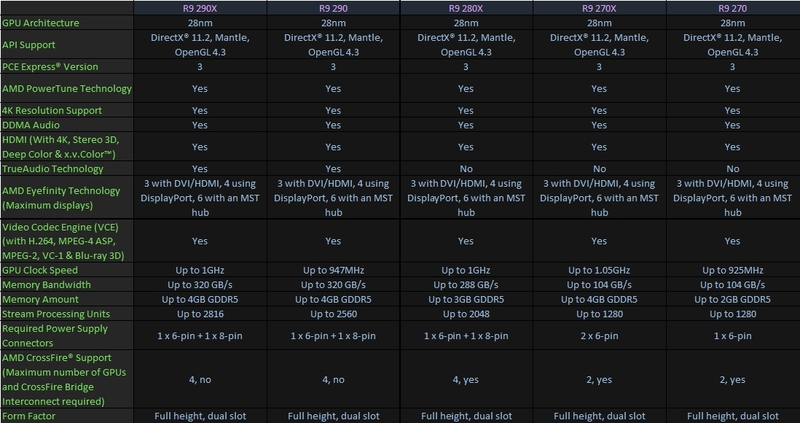 There’s optimization, and then there’s Mantle. Games enabled with Mantle speak the language of GCN architecture to unlock revolutionary performance and image quality. Enjoy the ultimate immersive gaming experience with innovative “wrap around” multidisplay capabilities. Improve performance of everyday tasks such as Web browsing, office applications and video rendering. With outstanding performance scaling, a system equipped with AMD CrossFire™ technology keeps you fragging while everyone else is reaching for an upgrade. Enables intelligent power monitoring to enable higher clock speeds and better performance in your favorite games. Allows your AMD Radeon™ GPU to consume virtually no power when in idle state. Play 3D games, watch Blu-ray 3D videos, and edit 3D photos on your 3D monitor, TV or projector. Experience resolutions up to four times higher than HD and see everything your opponent throws at you — without sacrificing a single detail. With the sonic brilliance of AMD TrueAudio technology, your games now sound as good as they look. With outstanding performance scaling, a system equipped with AMD CrossFire™ technology system keeps you fragging while everyone else is reaching for an upgrade. Additional hardware (e.g. Blu-ray drive, HD or 10-bit monitor, USB 3.0 ports, TV tuner, wirelessly enabled HDTV) and/or software (e.g. multimedia applications) are required for the full enablement of some features. HD Video display requires an HD video source. Not all features may be supported on all components or systems – check with your component or system manufacturer for specific model capabilities and supported technologies. AMD Eyefinity technology supports multiple monitors on an enabled graphics card. Supported display quantity, type and resolution vary by model and board design; confirm specifications with manufacturer before purchase. To enable more than three displays, or multiple displays from a single output, additional hardware such as DisplayPort™-ready monitors or DisplayPort 1.2 MST-enabled hubs may be required. A maximum of two active adapters is recommended for consumer systems. AMD CrossFire™ technology requires an AMD CrossFire Ready motherboard and may require a specialized power supply and AMD CrossFire Bridge Interconnect. Check with your component or system manufacturer for specific model capabilities. AMD PowerTune and AMD ZeroCore Power are technologies offered by certain AMD Radeon™ products, which are designed to intelligently manage GPU power consumption in response to certain GPU load conditions. Not all products feature all technologies – check with your component or system manufacturer for specific model capabilities. AMD TrueAudio™ technology is offered on select AMD Radeon™ R9 and R7 200 Series GPUs and is designed to improve acoustic realism. Requires an enabled game or application. Not all audio equipment supports all audio effects; additional audio equipment may be required for some audio effects. Not all products feature all technologies—check with your component or system manufacturer for specific capabilities. AMD App Acceleration is a set of technologies designed to improve video quality and enhance application performance. Full enablement of some features requires support for OpenCL™, DirectCompute or DirectX® Video Acceleration (DXVA). Not all products have all features and full enablement of some capabilities and may require complementary products. AMD HD3D is a technology designed to enable stereoscopic 3D support in games, movies and/or photos. Requires 3D stereo drivers, glasses, and display. Not all features may be supported on all components or systems – check with your component or system manufacturer for specific model capabilities and supported technologies. 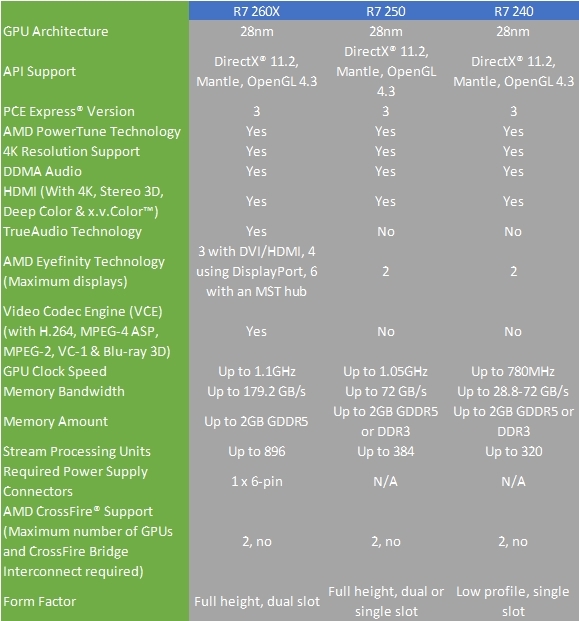 GCN Architecture and its associated features (PCI Express® 3.0, AMD ZeroCore Power technology, AMD PowerTune technology etc.) are included in the AMD Radeon™ R7 250/240 graphics cards. Not all technologies are supported in all system configurations—check with your system manufacturer for specific model capabilities. Utilization of PCI Express 3.0 bandwidth requires a mainboard equipped with a PCI Express 3.0 PHY. Not all mainboards feature this technology – check with your component or system manufacturer for specific model capabilities. Additional hardware (e.g. Blu-ray drive, HD or 10-bit monitor, TV tuner) and/or software (e.g. multimedia applications) are required for the full enablement of some features. Not all features may be supported on all components or systems – check with your component or system manufacturer for specific model capabilities and supported technologies. AMD App Acceleration is a set of technologies designed to improve video quality and enhance application performance. Full enablement of some features requires support for OpenCL™ or DirectCompute (including AMD’s Universal Video Decoder (UVD)). Not all products have all features and full enablement of some capabilities and may require complementary products. AMD Dynamic Switchable Graphics technology requires either an AMD ―A‖ series APU or an Intel processor, plus an AMD Radeon™ discrete graphics configuration and is available on Windows® 7 Professional, Windows® 7 Ultimate, Windows® 7 Home Premium, and/or Windows® 7 Home Basic OS. Linux OS supports manual switching which requires restart of X-Server to switch between graphics solutions. With AMD Dynamic Switchable Graphics technology, full enablement of all discrete graphics video and display features may not be supported on all systems (e.g. OpenGL applications will run on the integrated GPU or the APU as the case may be). Always check with your system manufacturer for specific mode capabilities and supported technologies. AMD HD3D is a technology designed to enable stereoscopic 3D support in games, movies and/or photos. Requires 3D stereo drivers, glasses, and display. Not all features may be supported on all components or systems – check with your component or system manufacturer for specific model capabilities and supported technologies. A list of supported stereoscopic 3D hardware is available at http://www.amd.com/HD3D. AMD PowerPlay™ are technologies, offered by certain AMD Radeon™ products, which are designed to intelligently reduce or eliminate GPU power consumption in response to certain GPU load conditions. Not all products feature all technologies – check with your component or system manufacturer for specific model capabilities. Perfected: Get outstanding performance and be part of the action with life-like environments and effects that offers realism for a great gaming experience. Additional hardware (e.g. Blu-ray drive, HD or 10-bit monitor, TV tuner, wirelessly enabled HDTV) and/or software (e.g. multimedia applications) are required for the full enablement of some features. HD Video display requires an HD video source. Not all features may be supported on all components or systems – check with your component or system manufacturer for specific model capabilities and supported technologies. AMD Dynamic Switchable Graphics technology requires either an AMD “A” series APU or an Intel processor, plus an AMD Radeon™ discrete graphics configuration and is available on Windows® 7 Professional, Windows® 7 Ultimate, Windows® 7 Home Premium, and/or Windows® 7 Home Basic OS. Linux OS supports manual switching which requires restart of X-Server to switch between graphics solutions. With AMD Dynamic Switchable Graphics technology, full enablement of all discrete graphics video and display features may not be supported on all systems (e.g. OpenGL applications will run on the integrated GPU or the APU as the case may be). Always check with your system manufacturer for specific mode capabilities and supported technologies.